Five years ago when Aaron and I got married we sat down and tabulated our combined debt and realized that we had $446,000 in debt. In our defense, $405,000 was in land and homes, but that still left us with $41,000 in consumer debt. Today five years later we have paid off $293,000 in debt with a remaining balance of $153,000 on our primary residence. I like to think that Aaron and I are pretty normal. We had the typical consumer debt of cars, boats, credit cards and student loans when we got married. How did we pay off 293,000 in debt in 5 years? Fortunately when we got married a highly respected friend gave us a copy of Dave Ramsey’s book, “The Total Money Makeover”. I had read the book previously and was already mostly on board. Aaron read the book with minimal convincing and was instantly on board. We were both tired of debt and wanted to start our marriage with common financial goals. For those unfamiliar with Dave Ramsey, he is a writer and speaker who advocates debt reduction. He believes that your income is your greatest wealth building tool. By paying off debt, you are freeing your income to become your greatest asset. He specializes in helping people like us who were tired of debt find a manageable debt reduction plan that works. After reading his book Aaron and I decided it was time to make some changes. 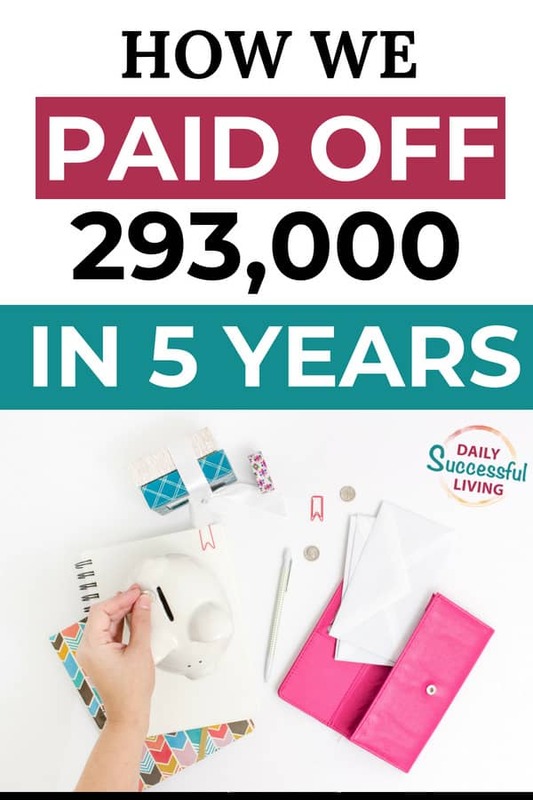 I added up all our monthly debt payments which totaled $4,175. I seriously choked when I saw this number for the first time. That is a lot of money to be paying each month. Even worse, almost half of that amount was just payment on interest. Each month only $2,200 was actually reducing our debt, the rest was going towards interest. Between our realization that we had almost ½ a million of debt (yes that number is correct) and then seeing the amount we were wasting each month on interest ($1,975) we decided to hit debt reduction hard. Dave Ramsey recommends a seven-step process to financial freedom. The first step is to build an emergency fund of $1,000 to help cushion against the unexpected. Since Aaron is in sales and our monthly income is partially determined by his commission we kept a 3-month emergency fund in place. I’m the type that needs emergency funds for my emergency funds, so I just couldn’t handle only having a $1,000 emergency fund. If you are struggling to build your emergency fund, I highly recommend trying out a program like Digit. It is a phone app that literally does all the work of saving for with auto transfer based on your spending and account balances. You can read more about it in my post: Digit Review: How to Automate Your Savings Plan in 5 Minutes. Related Post: How our emergency fund saved us $1,500. Once we had a comfortable level on our emergency fund, we went to work on reducing your debt quickly even though we were short on cash. A debt snowball is when you list your debt smallest to largest. You ignore interest rates and all the conventional stuff you learn in business school and throw everything you can at the smallest debt while making minimum payments on everything else. Once the smallest debt is paid off you start working on the next debt. You take the amount you were paying towards the first debt and combine it with your current payment and then throw anything extra you have at your second debt. I know it sounds kind of complicated, but it is actually pretty simple when you lay it out on paper. I love the forms like this one & this one to help track everything. We paid off as much debt as we could from our savings and then started on the debt snowball. It felt like it took forever, but eventually, we worked through my student loans, Aaron’s Car, My Car, Aaron’s credit card debt and then the boat. Once we finished up the boat we started working on the land. We had it paid down to around $48,000 when we were finally able to sell my old house. Fortunately, I had purchased the home back in 2003, so we had a decent amount of equity accumulated even in this market. With the sale of my home, we paid off the remaining balance on the land. So after five years of marriage, we were finally debt-free except for our home. We paid off $293,000 worth of debt. Of the $293,000 we were able to cash flow $156,000 and the remaining $137,000 came from the sale of my house. I’m sure some people are going to think it is all about income. And yes, we do have a pretty decent income. However, during this time period, we had sporadic income. Aaron is in the construction industry and ended up jobless two different times. He was able to rebound pretty quickly, but when you are in sales it takes 3-6 months to get back on track. There were months when we couldn’t pay extra and I had to pull money out of our emergency fund to get by. It wasn’t always easy, but now that our monthly payments have dropped from $4,175 to $1,100 per month all of the sacrifices were totally worth it. 5 weeks ago the company Aaron was working for went out of business unexpectedly. If this had happened five years ago we would have been in trouble. I can’t even begin to imagine how scared and stressed out I would have been. My husband is a rock star and had four job offers within two weeks. After a lot of research, he is completely changing industries and leave construction. It is a great opportunity, but it will most likely take him 6 months to get back to his previous income. Because of our decision 5 years ago to get out of debt we have the freedom to allow him to make a drastic career move. Because the debt is gone we can easily survive on my income alone. Also, after getting out of debt we focused on Dave Ramsey’s 3rd step which is a 3-6 month emergency fund. We finished our emergency fund the week before Aaron’s company went out of business. 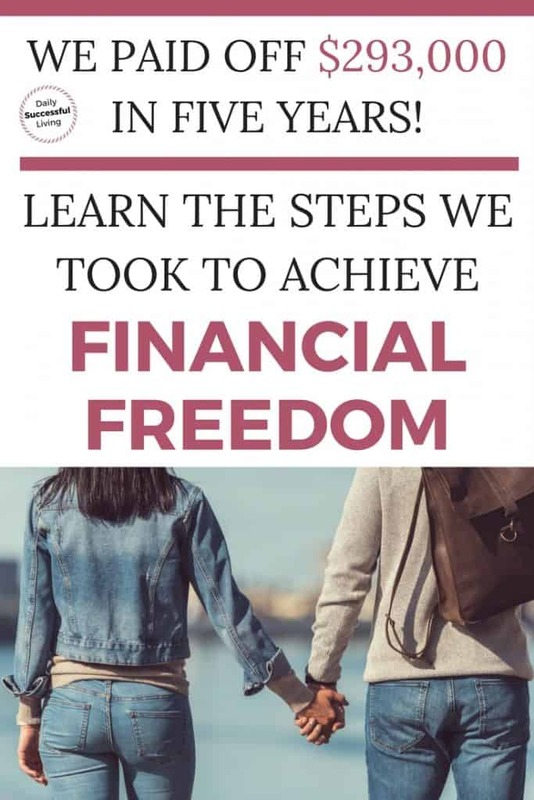 I love the fact that our financial freedom is allowing us to make meaningful decisions about our future without being stressed about paying the bills. There were times when I wondered if all of the scrimping and saving was worth it. Five weeks ago, I knew that our sacrifices were invaluable. Over the last couple of week, I’ve thought a lot about what we did to actually accomplish this goal. There isn’t any one answer, but for us, the following steps needed to happen. Part of the budgeting process is learning to cut your expenses. I can’t tell you how many times I went over my budget to find little spending leaks. It is crazy how quickly those spending leaks add up. If this is something you struggle with I highly recommend taking my new class How to Find and Eliminate Spending Leaks in Your Budget. Obviously, I’m a bit biased since it is my class, but I really do recommend trying it out. Your budget will never work unless you learn to actually control your spending and often our biggest money mistakes are ones we don’t even notice. If you aren’t ready for a class, then download my Free PDF Download: 6 Step Guide to Eliminate Overspending. Our number one goal over the last couple of years was to pay off our debt. We were tired of debt, which meant that virtually every decision we made was done with this overarching goal in mind. We got sidetracked here and there and didn’t always make the best decisions, but knew that ultimately debt reduction was our priority. There is no way we could have done it without working together. I may love to budget and manage money, but I couldn’t have done it if Aaron was out spending money right and left. We had our own spending money, but any large purchases had to be approved by both parties. We set aside money to do the things that we love. We just shifted our focus slightly. Our vacations were all centered around either family activities or climbing/canyoneering trips. We focused on inexpensive trips that left memories rather than crazy trips around the world. Aaron and I carefully reviewed our wants and our needs and used this to control our spending. We stayed social but limited our eating out to special occasions. We did BBQ’s and potlucks and lots and lots of home-cooked meals. If you are trying to decrease your grocery budget check out this post – 14 Ways to Save Money on Your Grocery Bill. We focused on creating memories rather than spending money. We involved the kids and let them know our goals. They knew what was in the budget and understood that they wouldn’t be getting name brand clothing from us. Multiple times we thought about selling the boat, but ultimately decided it was the one thing our teenagers would always be willing to do with us. Was it the best decision financially no, but well worth it for the memories we created. When we started this process we knew it was going to be a lot of work and that we both needed an image of our future life to keep us moving forward. We both wanted the financial freedom to be able to help our kids, to travel and to serve missions for our church. These dreams are all well and good, but we also needed something a bit more immediate to work towards. For us, it was becoming scuba certified for a trip to Bonaire this fall. Having a future trip to dream about really helped us get our plans into high gear. We constantly set short and long-term goals that would be rewarded as we accomplished milestones. Having something to work towards really helps to solidify goals. Throughout our journey, we have continued to tithe to our church and help friends and family in need. I firmly believe that helping others is the way to true happiness. We have always set aside funds to help others and include that as part of our budget. My goal in the future is to increase this amount significantly as our financial situation improves. You will never become debt free without self-discipline and sacrifice. The old phrase, “you have to want it to win it” is 100% applicable. You will not succeed unless you are willing to work, work and then work some more. Aaron and I both worked a lot of extra hours to be successful at our jobs. We continually educated ourselves to be valuable employees and were always looking for additional opportunities for success. We feel off the wagon occasionally, but overall just kept continually moving forward. To become debt free you will sacrifice. We have a beautiful home, but our furniture is old, we have three paid for vehicles but all of them have over 180,000 miles. We turned down numerous vacations and random activities that would have cost more money than we had budgeted. You’ll find yourself making do with stuff or going without. Of course, I do have to mention that this is all within the perimeters of a middle-class lifestyle. Our sacrifices were nothing compared to some people I know. We chose to put a goal before “stuff” and although it was hard every sacrifice has propelled us in the right direction. Our marriage is stronger as a result of working towards a common goal. Our relationship with our kids is stronger. They have seen what we’ve accomplished and all three of our girls are making financial decisions that make me proud. Every Sacrifice Was Worth It! There is no one answer to becoming debt free. You have to flip your internal switch and decide that you are tired of debt and are willing to do anything to pay it off. Trust me when I say it is going to be hard and there are times when you want to just give up. I’m so thankful that Aaron and I made the choice five years ago to reduce our debt. I’ve always known it was important but having his company go under so unexpectedly really brought home to me the importance of being financially prepared. Instead of being scared we were able to take this experience and turn it positive. I’m really excited for Aaron and his career shift. Life is good! How to Find and Eliminate Spending Leaks In your Budget – My class on how to cut your day to day expenses so you can actually make your budget work. Grocery Budget Makeover Program – This program will save you money on your groceries! PS. You don’t have to wait for the September Class. If you sign up for the waiting list they have an express class you can take that is awesome! EveryDollar – Amazing budgeting tool from Dave Ramsey – There is a free version that is super easy to use. Mint – Another free online budgeting tool that I have used in the past. Quicken – The budgeting tool I use for financial tracking and management. Huge congrats! We are weeks behind you with around the same amount to pay off 😀 It’s amazing what you can do when you put your mind to it and yes Budget, Budget, Budget!!! Wow, congratulations!!! I’m so excited for you guys. I know you already know this, but you are going to love being debt free. It is seriously the absolutely best thing we did for ourselves and our marriage. Great job! Your reaction to seeing the amount of money that needed to be paid is understandable. It can be very daunting to face that numerical fact. Thanks! I must admit when we added it up, it was a real slap in the face! Great story! Definitely some awesome tips and advice to keep in mind. Thanks for sharing! Thanks! I’m glad you enjoyed my story. You are 100% correct. Debt equals stress! I’m so impressed with your debt/saving skills! We still have 3 years left on our home and I’m literally counting down the months. I want to be completely debt free so bad. Such a great post! Really organised and easy to read, and yalls journey is incredible congrats! Looking forward to reading more! Thanks! I’m glad you enjoyed our story. It was tough, but worth it in the end.